So I am extremely excited because I had an article on the GEAR UP grant I served on accepted by the academic publication Reflections: A Journal of Public Rhetoric, Civic Writing, and Service Learning. 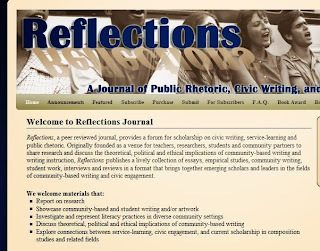 The work done by contributors to Reflections is important because much of what is included comes from community partnerships, demonstrating the great role of writing in the public sphere. For me, this great news has also inspired a necessary pause for reflection and revision. Rereading this piece for revision has reminded me of the great work I've been lucky enough to have been a part of in Tucson, although re-reading my writing, even when it's been accepted (albeit with revisions), draws my attention to the places I really want to strengthen given this amazing opportunity. Revision is good and necessary work. It reminds me of a writing insight a creative writing professor once told me about the balancing-act a writer walks between feeling confident about a piece and severely doubting oneself. As a composition teacher, I would revise that bit of insight by adding that revision is the process that makes the tight-rope feel wider while also providing the writer with one of those bars to increase steadiness. My piece will not be out for a few months, giving me some much needed time for revision and reflection, and reflection for revision. And of course I will be sure to post again when the article comes out. In the meantime, read an article in Reflections by Octatio Pimentel (pdf from website) on Racism and Composition.